1. Heat oil and cook mushrooms in a large covered pan for about 6 minutes, turning occasionally. 2. Beat eggs, horseradish sauce, chopped parsley, smoked salmon and seasoning together. Pour into a saucepan and cook over a medium heat, stirring occasionally. As egg begins to set, reduce heat and gently stir in the soured cream. 3. Continue cooking until egg has almost cooked through. 4. 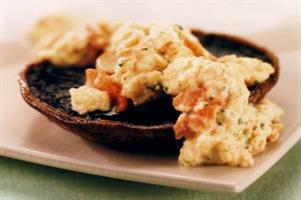 Serve mushrooms on warm plates topped with the creamy scrambled eggs.